Posted: Mon 01 Jun, 2015 11:11 am Post subject: Iron Age ? Wooden helmets from Uglemosen, Lolland, Denmark. During and just after WW2 there was extensive peat digging all around Denmark to supply fuel. In the bog Uglemosen at Lolland, they stopped as they found a skull. Examination later showed a possible bullet-lesion under the eye, which have made him survive some time before death. Anyways his skull was found in the bog (still undated). A mystery in itself. Pretty lucky the skull was found as during the examination 3 unique wooden helmets were discovered (apparently this one is in private ownership). More grainy image of two of the helmets. The C-14 of the wood gave a date of ~2000 BC, though it is fairly hard to believe that the helmet were created so early. The problem is that the helmets are made of root wood from the bog, probably alder. Peat digging has been done as early as the late bronze ages, so old wood from the bog could have been used to make the helmets at some later time. Pottery and skeletal material from the bog showed a C-14 date of ~450 BC. This date can also be totally unrelated to the helmets (as the skull with the possible bullet-hole). Bogs in Denmark can have deposits over very long time spans. These are normally dated to 450-350 BC, but there are also problems with the dating at this site [according to Martens]. The article by Jes Marstens discusses the find on page 158, and shows a picture on page 159 of one of the helmets. Flemming Kaul makes a guess the helmets are created in connection with a Cimbrian incursion to Noricum in 113 BC and survivors took the knowledge of the helmet type with them back north, where they created their wood copies and deposited them in the bog. Then again the wood helmets could have been used in Northern Europe after 500 BC, when imported bronze no longer reaches the area (or even before for non-noble troops). So they need not to have discovered the type going south and then returning home with knowledge of the type. It is though a possibility, but a very tentative one, as the dating for both Uglemosen and Negau are very uncertain. What a surprise! Wooden, not metal, helmets, perhaps from the Iron Age, found in a bog in Denmark. Rare archaeological finds, I must say. Accepting that they are correctly identified, what is it about them that tells one that they are not wooden food bowls or wooden shield bosses (just curious). Same here, I think the only way you can day for is if there is mounting system to secure the helmet to one's skully or it was found on the skull's head. Seems like to me that the diggers, or the article wristers loked aty the bowls , seeing that one was shaped a bit like a WWII US army helmet and one like a WWI British brodie helmet and drew the conclusion that they were helmet's from that. I can totally understand the skepticism from you both. They do in fact look like more modern helmets and very likely the cause of the first conclusions drawn. I have found some extra info. They were not found during WW2, but afterwards, as peat digging in the area continued until 1950. The first helmet was found in 1948 and was examined by researchers, but then given back to the finder. The family of the finder of the first helmet kept it and allowed it to be further examined in 1994 (so the picture above in private ownership must be the 1948 helmet). It is 34,5 cm long and 19 cm tall and have a great fit for a human head. It is the one with a midline crest and a pronounced rim. Having a mid-crest does make it very unlikely it being a bowl. As for being a shieldboss - it is possible, but they would be pretty damn massive. The helmets does in form look like some of the Slovenian Negau bronze helmets. Then in 1949 two more helmets were found. The first one dissolved away, but had a piece of a bone spear or bone arrowhead lodged into the wood, which does strengthen the idea of it being a helmet. The second one was examined in 1949 and then returned to its finder, but the daughter of the finder sold the helmet and the trail ran cold, so the Museum had no idea of its whereabouts, until it was re-found by chance in 2009. The two helmets (if they are so) have now been given by the owners to the state as "Danefæ" to the National Museum. Danefæ: skatte fra den danske muld : til Hendes Majestæt Dronning Margrethe 2 (page 90-93). Yeah, the medial ridge is a pretty good vote for it being a helmet! It *would* be nice to see holes for a chinstrap, at least, but I guess I'll have to make one anyway. Cool finds, even if they are just cereal bowls! Interesting why they made this crest (it seems quite small for having any kind of defense function and nothing can be inserted into them). Had it any purpose or was it simply to show in imitation of other helmets, that it is indeed a helmet? About the lack of chinstraps, maybe the helmet originally had some inner lining to keep it more securely on the head? Since I'm no carpenter why the specific choice of alder. Why not other types of wood? Oak is very sturdy, but probably too heavy? It could be that alder root wood from a bog in itself had magical qualities connected with bogs as we know from both celtic and germanic religion. That could be one answer for the choice. Its interesting that at least one is a very good fit for the human head but I'm wondering how much of that is due to warping whilst in the ground? One thing the very interesting articles above don't say is what tool marking evidence there is. If they were turned they I can't see them being helmet, our forbears knew the human head wasn't round. I'm wondering why, if they are helmets, they saw the need to put a rim on them as well? Very interesting, shall watch this further! Well, yes, but weren't there some oval 'Celtic' type shields with wooden bosses with medial ridges (sort of echoing the wooden spine going up and down the shield)? Again, I accept that it has been decided as a helmet, just trying to follow the thought process. Interestingly enough the wooden shield bosses of the iron age shields found in bogs in Denmark are lenticular! Martens shows an example also found in from Kvärlöv, Scania as fig. 9 page 158. Here the wood is willow and the handle is juniper. Its a Hjortspring type [See: http://samlinger.natmus.dk/DO/10772] carved from one piece of wood and riveted into the shield (possibly wood rivets, though none were found). But yeah they do have a medial ridge! Actually a bog normally turns organic material mushy so warping because of pressure makes objects flat and not round. This alder root wood was apparently tough enough to avoid flattening. Good point: I have never seen any info about the wood carving techniques that could have been used to make these objects. I know though that Scandinavians in the late Bronze Age and Early Iron Age had very sophisticated wood carving and wood-turning craftsmanship, so over large areas of Scandinavia you have basically no pottery in the Early Iron age, apart from some crap pottery made specifically as cremation urns, as that was the religious thing to day at the time! See the Martens article, page 169. So they did many things in wood, so why not helmets? But if it's turned like a wooden bowl, then it weakens it being a helmet, but then why the crest if its a bowl? Only Jutland and Funen had sophisticated pottery, whereas to the East of Denmark (Zealand, Falster, Lolland, Scania), Sweden and Norway it was all wood that mattered. Apparently, lightness is important (as you suggest, v oak). Just been reading around (only secondary stuff so not worth citing) and alder and willow were both commonly used for shields (e.g Hjortspring, Saxon, Irish). I'd always thought of lime/linden as the wood to go for, so maybe I've just learned a little more! Nice pics of the shields by the way. P.S. Apparently Alder is also very good for electric guitar bodies (ain't Wikipedia wonderful). The ridge could simply be an imitation of the bronze version. Scandinavia has produced stone axes that are laboriously shaped to resemble early cast copper and bronze axes, *complete with casting seam*! There is also a flint "scimitar" that copies a bronze one, including the curly tip. Compared to things like that, a ridge or rim on a wooden helmet is child's play. Heck, it's just a matter of *not* removing wood in those areas. If it's helmet-shaped, I doubt it was actually turned. It's more likely that it was roughed out with adzes and chisels. I believe this was also the method used to make the bosses upon the wooden Celtic and Roman shields. Oval turning has been known in the past and today, however. It's merely a matter of turning it off-centre. This is more difficult with a meat-powered lathe than machine powered, so it wasn't used as often back in the day; you could see it on tool handles, but not so much on large pieces like bowls. It's possible that it could have been turned round, and then steam or hot water was used to distort it into an oval shape. Really interesting find, never heard of this before! Maybe they went with alder because it was simply very common around there? Alder is a type of tree that grows in bogs and wet grounds. Oak or lime don't, that's why they didn't use them IMO. Large pieces of wood are not that easy to transport after all so locally sourced wood is sometimes the best option. According to Amstrong, 'bog oak' was the preferred material for the classic wire strung 'Celtic' harp. Regular oak is almost the last wood you would want to use for a harp. Bog oak is unusually dense and resonant. Bog alder could have unusual properties, as well. What is actually REALLY peculiar with this find is the C-14 dating of the Alder wood, which shows that is died around 2000 BC. I think the scholars have a immediate reaction against attributing the find to the Neolithic - Bronze Age transition in Denmark and then "reach" to the Early Iron Age as the wooden helmets are somewhat similar to the Negau helmets from Slovenia. We know that peat digging took place from the Bronze Ages into modern times. So alder root wood is apparently a good material; but surely not when it dies and start to undergo chemical changes in the bog. Would a 1500-2000 year old dead alder root wood in a Danish peat bog be prime material for constructing anything with in the Early Iron Age. Remember one of the helmets found in 1949 did deteriorate when uncovered. So the whole idea of Iron Age Helmets rests on it being more reasonable that people used 1500-2000 year old dead wood from a bog to imitate Negau Bronze helmets from the south, than it being actually from the time period the C-14 of the helmets indicate. 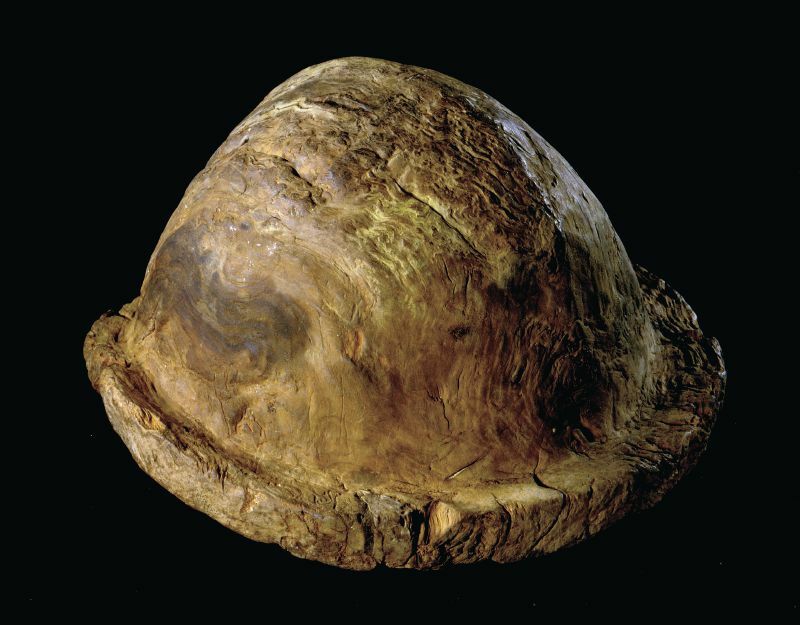 ..."radiocarbon dating of one of the Uglemose helmets (AMS dated to 4060±95BP), Heinemeier et al. 1994, 290) prompts caution. The date assigns the helmets to the Neolithic, a period from which this type of artefact would not be expected." Maybe we should simply consider the possibility that the helmets ARE from ~2000 BC and thus at exactly the same time period as the new found flint dagger with bark still on the handle also found on Lolland at Rødbyhavn. So I guess it all goes to check how great material 1500-2000 year old dead alder root wood really is. I would normally think it would make the wood more spongy/mushy; but off course I could be wrong. Yet I wouldn't think of 1500 year old bog wood found for instance from Illerup or Nydam to be the first thing I would use to construct a helmet with? What is perhaps needed is a C-14 dating from the other helmet. If that is also 2000 BC, then it surely gets interesting. As an example of early Scandinavian wood-turning techniques you have found these wooden artefacts at Hjortspring (350 BC), which are classified as pyxides = cylindrical boxes, that in the classical world contained cosmetics or jewelry. Best parallel is a find from Bornholm, and also in question two from Öland and Gotland. The Hamburg ones looks somewhat different and most from that area is made of high-quality pottery (not wood). Martens (again): This article is about the Scanian lenticular shield-boss from the Early Iron Ages; but has a small section on the pyxides. The discussion is important to determine where the attacking army came from, before losing, and having their weapons and boat(s) dumped in the Hjortspring bog by the locals. Bog oak is highly prized by custom wood workers in this country, too. I was talking to someone down in the Washington, DC area about some that had recently come to light, and I would love to have a harp made of the stuff! But I didn't get any. The Northwest Coast Indians of this continent used a lot of wooden armour, including helmets, so I don't know why people of the neolithic culture in Europe would not have at least made helmets. Choose the right kind of wood, and it would work really well. I think ordinary oak would split too easily, which means you would choose another wood for shields. I have read that linden wood was popular, because of its resistance to splitting, but then I also read that someone pooh-poohed that, apparently because while Scandinavian literary sources specify linden wood, the surviving shields are made from spruce, fir, or pine. As for choice of Alder it is quite common in Denmark, as Denmark had extensive wetlands (fewer today because of modern farming and extensive draining). Oak would also be present, so it seems like a deliberate choice of alder over oak for these helmets (it is not from lack of access). As for bog oak & bog alder I think that is it the idea of harvesting it from the bog itself, that gives it "magical properties". Maybe root wood have denser and stronger qualities than branch wood. What can be the course of bog oak choices for harps; could be in line with the hypothesis that the Cremona luthier families (Stradivari, Amati, Guarneri) build violins of such superior sound, was because the trees used had grown during the coldest part of the "little ice age". Having very thin growth rings makes for an extra dense wood, that accordingly should resonance better. As oak can grow to be very old, then a bog oak found today would likely have grown also during the little ice age. As for viking shields of being of different materials could very well be the case: If you wanted a thin shield that could split easily (used for dueling, where you can then use the shield as a sword catcher) you chose certain types of wood OR a sturdier thick shield that can withstand arrows and spears when working from a shield wall, you chose other types.